Brooding o’er darkness like a dove. It has been suggested…that all laughter had its origin in a sort of cruelty, in an exultation over the pain or the ignominy of an enemy… [But] another philosophy would say, for instance, that the laughter is due not to an animal cruelty but to a purely human realization of the contrast between man’s spiritual immensity within and his littleness and restriction without, for it is itself a joke that a house should be larger inside than out. According to such a view, the very incompatibility between the sense of human dignity and the perpetual possibility of incidental indignities produces the archetypal joke of the old gentleman sitting down suddenly on the ice. We do not laugh thus when a tree or a rock tumbles down, because we do not know the sense of self-esteem or serious importance within. — “Humour”, in On Lying in Bed. Faith is always at a disadvantage; it is a perpetually defeated thing which survived all its conquerors. The desperate modern talk about dark days and reeling altars, and the end of Gods and angels, is the oldest talk in the world: lamentations over the growth of agnosticism can be found in the monkish sermons of the dark ages; horror at youthful impiety can be found in the Iliad. This is the thing that never deserts men and yet always, with daring diplomacy, threatens to desert them. It has indeed dwelt among and controlled all the kings and crowds, but only with the air of a pilgrim passing by. It has indeed warmed and lit men from the beginning of Eden with an unending glow, but it was the glow of an eternal sunset. — “Watts’ Allegorical Painting”, in On Lying in Bed. I go back to my writing table; at least I do not exactly go back to it, because they have taken it away, with silent treachery, while I was meditating on death at the window. I sit down on the chair and try to write on my knee; which is really difficult, especially when one has nothing to write about. I feel strangely grateful to the noble wooden quadruped on which I sit. Who am I that the children of men should have shaped and carved for me four extra wooden legs besides the two that were given me by the gods? For it is the point of all deprivation that it sharpens the idea of value; and, perhaps, that is, after all, the reason of the riddle of death. In a better world, perhaps, we may permanently possess, and permanently be astonished at possession. In some strange estate beyond the stars we may manage at once to have and to enjoy. But in this world, through some sickness at the root of psychology, we have to be reminded that a thing is ours by its power of disappearance. – “On Being Moved”, in On Lying in Bed. [The birds] in the Byzantine scheme would have been as abstract and typical as the birds of an Egyptian hieroglyphic. The birds of the later realistic epoch, when the painters of the nineteenth century had brought to the last perfection, or the last satiety, the studies of optics or of physics begun in the sixteenth, might well have been a most detailed and even bewildering display of ornithology. 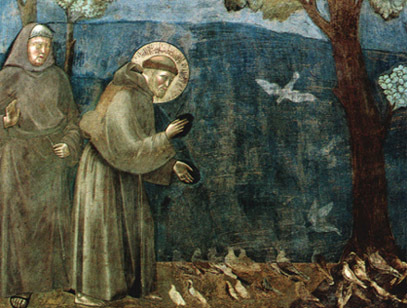 But the birds to whom St. Francis preached, in the vision of the thirteenth-century art, were already birds that could fly or sing, but not yet birds that could be shot or stuffed; they had ceased to be merely heraldic without becoming merely scientific. And as, in all studies of St. Francis, we always return to that great comparison which he at once denied with all his humility and desired with all his heart, we may say that they were not wholly unlike those strange birds in the legend, which the Holy Child pinched into shape out of scraps of clay, and then started into life and swiftness with a clap of his little hands. – “Giotto and St. Francis”, in On Lying in Bed. We can at once test the ethics of publicity by removing it from public life; by merely applying it to private life. What should we think, at a private party, if an old gentleman had written on his shirtfront in a fine large flowing hand: ‘I am the only well-bred person in this company’? What should we think of any person of taste and humour who went about wearing a placard inscribed ‘Please note quiet charm of my personality’? What should we say if people gravely engraved on their visiting card the claim to be the handsomest or the wildest or the most subtly, strangely attractive people about town? We should not only think, with great accuracy, that they were behaving like asses… we should also think they were wantonly reversing and destroying a principle of social amenity and moral delicacy. Yet modern business, especially in America, does really enforce this sort of publicity in public life. – “The American Ideal”, in On Lying in Bed.